At the end of 2009, as part of the Edhec/Axa Investment Managers (Axa IM) research chair on regulation and institutional investment, the Edhec-Risk Institute sent out a “call for reaction” to a study we had published earlier in the year called Impact of Regulations on the ALM of Pension Funds. The study focused on prudential and accounting regulations and how they should be embedded in the asset and liability matching (ALM) of pension funds. The study focused particularly on the Netherlands, the United Kingdom, Switzerland and Germany. We also published a study in the spring of last year that attempted to evaluate the reasons for current pension fund underfunding. That study was called The European Pension Fund Industry Again Beset by Deficits, and it was produced also as part of the Axa IM research chair. Regulations have tightened, making it important for the ALM of pension funds to take them into account. This tightening of regulations has sometimes had the adverse effect of leading to the closure of defined benefit pension funds. Modern ALM techniques, such as dynamic liability-driven investments, are instrumental in preserving minimum funding ratios. When these techniques are burdensome, either because management agreement is needed to rebalance a portfolio or because smaller schemes make continuous monitoring difficult, derivatives can be used. Overall, current funding shortfalls mainly reflect the reluctance of pension funds and their sponsors to use modern ALM techniques and take regulatory constraints into account. Pension funds have a unique ability to behave as very long-term investors, as pension liabilities are a by-product of the employment contract and no client-run is possible. As a result, they can benefit from investment opportunities that require a long horizon, whether for illiquid investments or for assets whose term structure of risk slopes downward (that is, in which time reduces risk). The increased short-termism of regulations, with the proposed IAS 19 reform implying full recognition of the volatility of the profit and loss (P&L) of pension funds in the P&L of the sponsor, adds to the excessive focus of investors on the P&L and makes the long-term replication of liabilities difficult, in particular for real liabilities. After all, matching these liabilities requires real assets, assets that imply short-term volatility in the accounts. In general, we argue that regulations should give pension funds incentives to build internal models that are full risk management systems rather than risk measurement tools: risk management is always useful. The call for reaction was meant to allow the respondent to express an opinion on these crucial themes. The questions were posed in a neutral manner to allow Edhec-Risk to analyse the use and perceived efficiency of ALM tools and concepts, rather than merely to explicate the degree to which practitioners agree with the conclusions of our research. 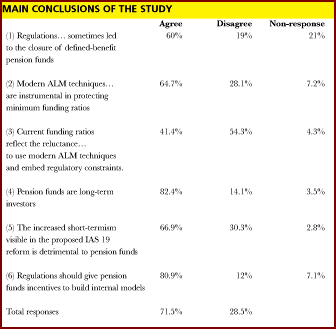 Edhec argued that prudential and accounting regulations must be taken into account in the ALM of the pension fund and of its sponsor; 95% of respondents agreed that these constraints were either somewhat important or very important and needed to be taken into account. Edhec argues that the use of modern ALM techniques and internal models can help mitigate the impact of tightening (prudential and accounting) regulations. Of the respondents, 85% agreed that modern ALM techniques are either a somewhat useful or very useful means of mitigating the impact of regulations. agree that current deficits reflect the reluctance of pension funds to adopt modern ALM techniques. Instead, they attribute these deficits to longevity (65.3% of the respondents think that longevity risk is the main risk faced by the pension system, a risk not addressed by modern ALM techniques). By contrast, there is unexpectedly strong support for the notion that pension fund regulation should encourage the use of internal models – more than 80% agree with this view and more than 40% strongly. The responses to our call for reaction corroborate the arguments made in the Edhec study (Amenc et al 2009) on the impact of accounting and prudential regulations on the ALM of European pension funds. In particular, respondents agree that pension funds should take a long-term approach to investing, but they also think that they should manage their short-term constraints; they agree that risk management protects minimum funding ratios better than high funding ratios do, and as such they believe strongly that regulations should encourage risk management – for instance, by allowing internal models. Dutch pension funds, which have already implemented risk-based regulation with strict minimum funding ratios, are supportive of the idea that minimum funding ratios should be implemented, as these ratios foster risk management. British pension funds, by contrast, with their chronic underfunding, fear that minimum funding ratios would involve a counterproductive tightening of prudential regulation of pension funds. Respondents also point out, as we do, that the funding ratio of the pension fund is not, on its own, a sufficient indicator of the degree of protection afforded pension benefits: the risk to the benefits depends on the combined risk of underfunding and sponsor default. Respondents argue that the use of modern ALM techniques cannot fully ensure that a pension fund is never underfunded, not only because funding depends on the contribution policy, but also because longevity risk has added significantly to liabilities. As a consequence, a specific measurement of the combined risk of sponsor default and underfunding is required. Contributions must be raised or assets may be pledged by the sponsor when this combined risk arises. Last, 78.5% of pension funds report that dynamic strategies are difficult to implement because management agreement is needed to rebalance a portfolio. Organisational problems keep pension funds from benefiting from dynamic investment strategies, even though these strategies are viewed with favour by both academics and practitioners: at the same time, 73.2% of pension funds agree that dynamic strategies ensure that minimum funding constraints are met. This article was based on research carried out within the Edhec-Risk/Axa Investment Managers ‘Regulation and Institutional Investment’ research chair. References: Amenc, N., L. Martellini, and S. Sender. 2009. Impact of regulations on the ALM of pension funds. Edhec-Risk publication.